These Exotic Jewelry Displays have a bold style, achieved through a natural design process. Each is formed using hand-carved wood molds and 15 to 20 layers of newspaper and rice paste, and cords of recycled paper twine or fine ropes of natural materials indigenous to the Philippines. 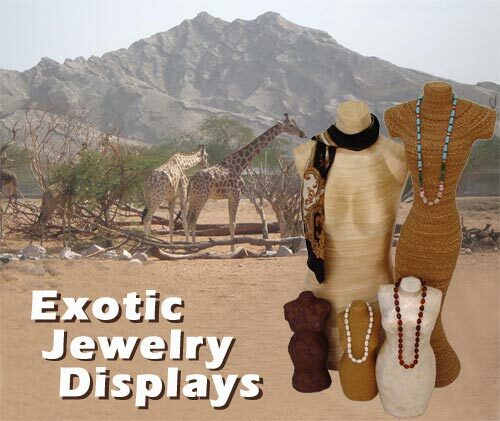 Give your store the unique look and natural feel of Exotic Jewelry Displays. Women's Paper Mache Bust Jewelry Display - XL. Use this Exotic Women's Paper Mache Bust Jewelry Display as an art piece, a shop window display or a unique gift. Women's Paper Mache Bust Jewelry Display - Medium. Use this Exotic Women's Paper Mache Bust Jewelry Display as an art piece, a shop window display or a unique gift.